Last night was the “Super Blood Wolf Moon” total lunar eclipse, so named because the Moon is currently closer to the Earth (super), it was a total eclipse (blood), in January (wolf). By the way, my favorite full moon name is “Worm Moon” in March. I think that would make a great story title. We just had a cold front come through, so it was cold, but perfectly clear. This was definitely the best and longest lunar eclipse I have ever seen, and the delightful enthusiasm from my young neighbors across the street added to my enjoyment. I considered trying to use my intervalometer to make a detailed time lapse, but I knew I’d want to play around with camera settings too much. So I used a sequence of shots to make a time lapse slideshow. The full Moon is basically lit like daylight. 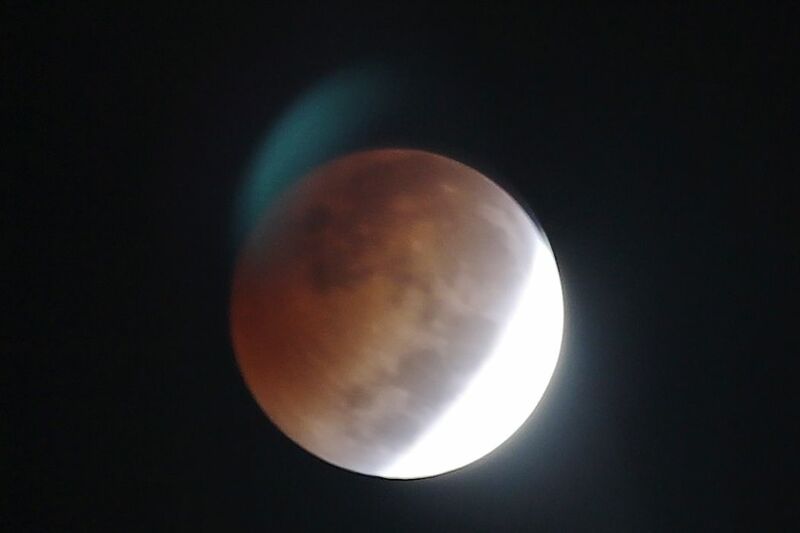 When the Moon was mostly eclipsed, it started to turn red. I could either set the camera to get the detail of the lit side (and lose all the part in shadow), or set it for the shadow. I thought the shadow picture was more interesting. 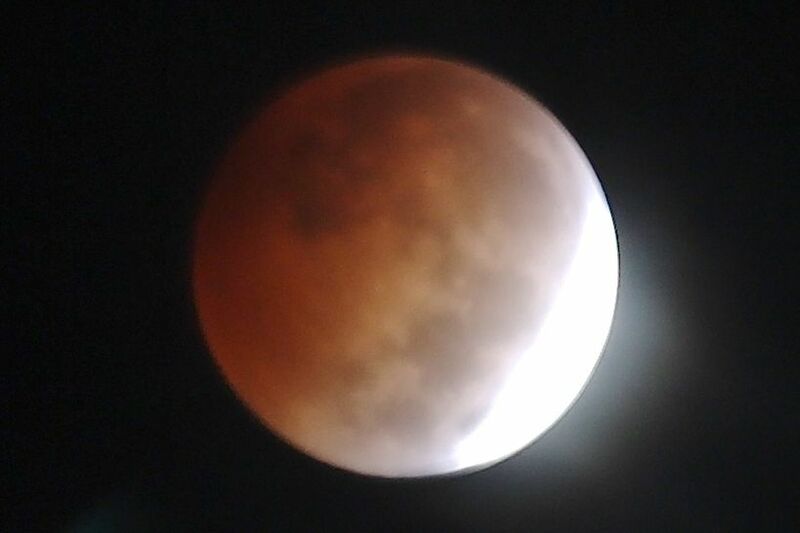 When the Moon was fully eclipsed, it was dark red. The camera picked up more color with a longer time exposure. It was harder to focus, though, since the Moon was so dim. When the Moon was coming out of the eclipse, dew had started to settle on the camera lens, so I got an interesting effect before I went inside to warm up my cold camera. And myself. Last night, as we exited the movie theater, we saw a beautiful conjunction of the Moon and Venus, with a bright Venus floating above a crescent moon. The cell phone pictures did not do it justice, nor did my hastily set up picture shot from the car window. So I prepared to take pictures tonight. The Moon had moved! Still a beautiful conjunction, yes? And since I had the tripod set up, I captured a picture of the Moon as well. It would be fun to explore its cratered surface. Moon: the Earth’s natural satellite! I should have gotten up earlier and driven to my favorite spot with a good view to the west. But I didn’t, so I found a spot in the neighborhood to snap a few pictures before the moon set below the tree line. Here I focused on the foliage instead of the moon and played around with color in post-processing. Which do you like better: the natural color or the more saturated color? I was happily driving home from my daughter’s high school graduation, loaded with camera gear, and I spotted this interesting juxtaposition of the Moon and a stoplight. Of course, I took a picture. And, for the first time in years, I decided to write a poem. You know you enjoy a hobby when you get up early and go out into the dark cold for it. This morning there was a conjunction of the Moon and Saturn, so I got up and went out. And while I was at it, I took some pictures of Jupiter and its moons, too. I checked – yes all four moons were on the same side of Jupiter this morning. I think it would be fun to make a time lapse of their motion. Might have to try it. I learned a new astrophotography trick last night. 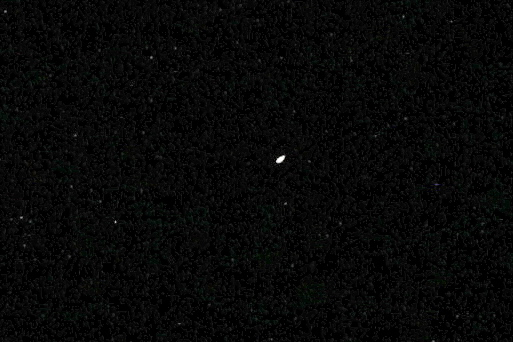 I knew I needed to manually focus for star pictures, but it’s hard to do with dim sources and a camera designed for autofocus. But my camera has a nifty real-time view on the LCD screen with a 10x view … so I could zoom in on the moon or a planet and use the real-time view to help me manually focus. Neat! And *much* sharper pictures. The real-time view also showed me that, in spite of the solid tripod, the 200 mm is actually quite shaky if I want to crop further in. So I get out my cable release so I could watch the image settle down on the 10x screen and then trigger the camera without actually touching it. I also already knew that although I could easily see both the Moon and Saturn, Saturn would disappear or the Moon would wash out without some filtering. Graduated neutral density filters to the rescue! 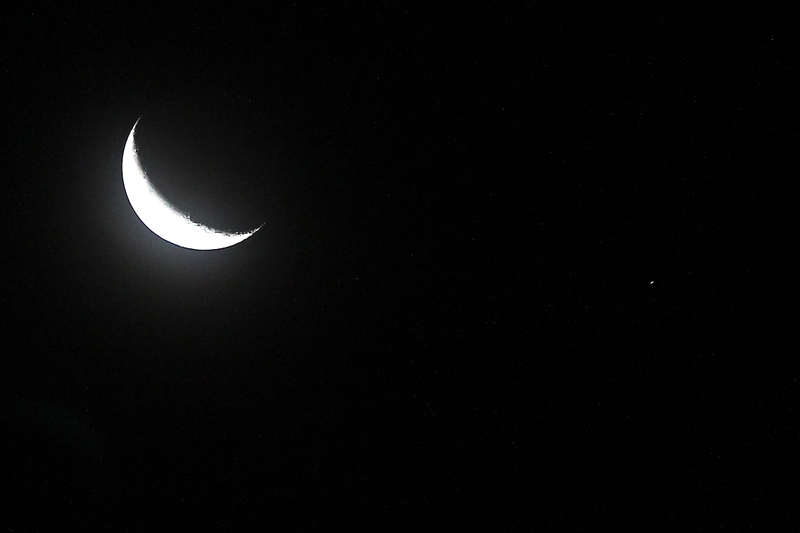 I used two (wish I had more and stronger ones) to dim down the Moon so you can see both bodies in the same photo. On October 8, I got up early to observe and photograph the lunar eclipse. These two shots were my favorites. The blue glow effect in this first shot is the result of a mistake – I wasn’t using a lens hood to prevent internal reflection. So it’s wrong, but I think it looks kinda cool, like a rocket has taken off from the lunar surface and left a trail behind, or the moon is sporting a tail like a comet, or a lunar volcano is venting … my imagination smiles at all the possible explanations. What do you think it looks like? This second shot shows a tri-color moon – the red “blood” eclipsed moon, a central gray band, and the still-sunlit white moon. So different from the normal, stark black and white moon. What would it be like to have a multicolored satellite?